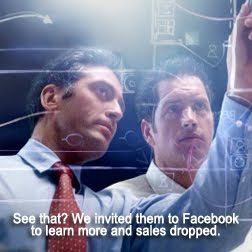 Most advertising professionals know that targeting audiences works. And most know that highly visible ads attract attention. However, new findings from a joint study conducted by the professors at the University of Toronto and MIT's Sloan School of Business suggest that pairing highly visible advertisements and content-linked ads can reduce purchase intentions. The study will be published in a future issue of Marketing Science. "If targeting works and visible ads work, you'd think visible, targeted ads would work even better," said Avi Goldfarb, an associate professor of marketing at the Rotman School of Management at the University of Toronto. "But they don't." Goldfarb, together with Catherine Tucker, drew their conclusions after analyzing data from 3,000 Web advertising campaigns. Why Does Ad Effectiveness Diminish? Goldfarb and Tucker attribute it to mistrust. The more aware consumers are that the advertisement is attempting to "sell" them something, the more likely they are to mistrust the content and the ad. Their conclusions may even indicate why Google Adsense tends to outperform affiliate programs and "paid posts" supplemented by advertisements. • Most banner ads only increase purchase intent by less than one percent. • Increased ad exposure only increases recall by approximately 5 percent. • More campaigns aim at increasing recall than attempting to increase purchase intent. Other findings are are available from the study. One that is particularly interesting for social media professionals is that two-way communication is sometimes seen as obtrusiveness. Assuming this analysis proves valid, advertisers would be best served to rethink how they approach online advertising, especially as it relates to how consumers behave. Generally, contextually-targeted advertisements capture an immediate response (clicks) whereas highly visible ads (including the solicitation of two-way communication) capture higher recall (awareness but not necessarily equal clicks). Since pairing the two tactical considerations diminishes effectiveness, advertisers may be better off establishing presence around contextual ads and increasingly the visibility of ads when there is no match. Contrary to most social media tactics, there might be enough evidence to suggest while customers prefer two-way communication and customers may be willing to fill out an online survey, prospects may not want two-way communication and are less willing to purchase products when the marketer also wants to capture demographic information prior to the purchase. All of this suggests a greater need for strategic planning associated with online advertising campaigns. Marketers have to do a better job prioritizing the the intent of the communication. Rebranding: Inside Out Or Outside In?